Lambda Labs adds the TX-3A active three way loudspeaker to its High End High Power TX series. Weighing in at 59.5 lbs (27 kg) the TX-3A features compact dimensions of 29.2 x 17.4 x 19.3 inch and - according to Lambda Labs - provides a versatile concept designed to match the most diverse sound reinforcement applications delivering oustanding audio quality and efficiency. The heavy duty 15” long excursion driver provides extended low frequency reproduction and an excellent impulse response even when using the TX-3A without additional subwoofers. The low frequency driver is driven by a 1600 Watt RMS DSP controlled amplifier module. Two further 200 Watt RMS amplifiers for the high and mid frequency range turn the TX-3A into a fully tri-amped loudspeaker. The low pass crossover frequency is 700Hz. The coaxial True Point Source high-mid frequency drivers with 3.75" and 1.75" coils split at 6300 Hz. The low crossover frequency results in a smooth and defined radiation pattern, since beaming effects and partial vibrations of the 15" driver are starting far above its transmission range. The elliptical Constant Directivity horn gives the TX-3A its even directivity pattern down to 1kHz with a nominal coverage angle of 50° x 50°. In order to achieve a broader horizontal coverage and higher SPL the consequent Coherent Wavefront Design and the versatile rigging allow for up to three TX-3A units to be combined in a 100° or 150° array. 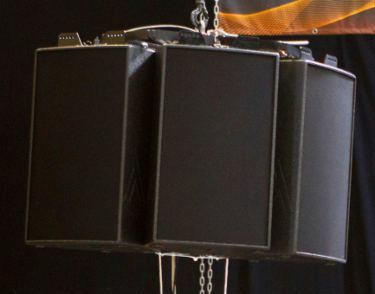 Basically the compact TX-3A was designed to deliver a stand-alone loudspeaker solution with reduced reflections for sound applications suitable for narrow, elongated venues. For larger applications requiring the array of up to 150° the high frequency units provide enough headroom while level in the low range increases by 6dB. Setting the TX-3A up for use with additional three MF-15A subwoofers is done by syimply switching a preset. Another preset even converts the TX-3A to a high end stage monitor with 46°or 66° monitor angle. Lambda Labs's enclosures are made roadworthy using polyurethane coating and stainless steel components.